Storytelling is a special art. Unlike written literature, it is dynamic, changing with the weather and the audience, yet it has an amazing integrity about it. From Cherokee creation mythology, through spirits of the lost Roanoke colonists, pirates, Jack tales, murder and ghost stories, from every kind of human experience to tales of the fantastic, North Carolina offers many opportunities to experience the special sharing and joining that unites the tellers and the told. Though Jonesborough, Tennessee holds the title as the "epicenter of storytelling", for hosting the National Storytelling Festival each October, the percentage of North Carolina stories told at the festival shows clearly the richness and vitality of the Tar Heel State's oral traditions. We can't give you the full experience created by a master teller's conjuring, but we can try to awaken you to the idea of listening and seeking out the tellers. Here then is a sampling of storytelling resources for North Carolina. If you know of others, please let us know and we will be happy to add them to our pages. You'll find a listing of NC Tellers and links to their sites as well as other current info about NC storytelling. Something of a comparison, but is actually a good primer on traditional NC tales. The Moonlit Road - Southern Ghost and mystery stories. http://www.ibiblio.org/storytelling/ Site includes information about Cherokee, Lumbee and Occaneechi storytelling as well as interviews and video. Internationally known and touring storyteller/writing consultant spends 22-25 weeks in NC schools helping young writers become better young writers using storytelling as the catalyst. Former staff storyteller for the National Storytelling Association in Jonesborough, TN. NC Storyteller and story advocate. Diane's website is a great resource. Gary Carden - Mountain story-teller. Site includes stories. David Holt - promo website - has links for books and recordings etc. 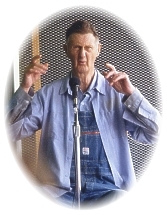 Chuck Larkin - Bluegrass Storyteller & Appalachian Humorist from Atlanta, GA.passed away in 2003, but his website has lots of his written stories. American Folklore - Famous American folktales and legends. NCNatural Selections Storytelling Books and books of Stories.